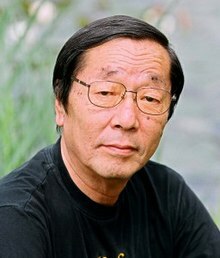 Masaru Emoto (江本 勝, Emoto Masaru, July 22, 1943 – October 17, 2014) was a Japanese author and pseudoscientist who said that human consciousness has an effect on the molecular structure of water. Emoto's conjecture evolved over the years, and his early work revolved around pseudoscientific hypotheses that water could react to positive thoughts and words and that polluted water could be cleaned through prayer and positive visualization. . Since 1999, Emoto published several volumes of a work entitled Messages from Water, which contain photographs of ice crystals and their accompanying experiments. Emoto was President Emeritus of the International Water For Life Foundation, a non-profit organization based in Oklahoma City in the United States. In 1992, Emoto became a Doctor of Alternative Medicine at the Open International University for Alternative Medicine in India, a diploma mill which targeted quacks to sell its degrees and was later shut down. Emoto said that water was a "blueprint for our reality" and that emotional "energies" and "vibrations" could change the physical structure of water. Emoto's water crystal experiments consisted of exposing water in glasses to different words, pictures, or music and then freezing and examining the aesthetic properties of the resulting crystals with microscopic photography. Emoto made the claim that water exposed to positive speech and thoughts would result in visually "pleasing" crystals being formed when that water was frozen and that negative intention would yield "ugly" frozen crystal formations. Emoto held that different water sources would produce different crystalline structures when frozen. For example, he held that a water sample from a mountain stream when frozen would show structures of beautifully shaped geometric design, but those structures would be distorted and randomly formed if the sample were taken from a polluted water source. Emoto held that these changes could be eliminated by exposing water to ultraviolet light or certain electromagnetic waves. In 2008, Emoto published his findings in the Journal of Scientific Exploration, a peer reviewed scientific journal of the Society for Scientific Exploration. The work was conducted and authored by Masaru Emoto and Takashige Kizu of Emoto’s own IHM General Institute, along with Dean Radin and Nancy Lund of the Institute of Noetic Sciences, which is on Stephen Barrett's Quackwatch list of questionable organizations. In the experiment, more than 1,900 of Emoto's followers focused feelings of gratitude toward water stored in bottles, which was then frozen and its crystalline formations inspected. The gratitude-focused crystals were rated slightly more "beautiful" than one set of control crystals and slightly less "beautiful" than the other controls. An objective comparison of the samples did not reveal any significant differences. Commentators have criticized Emoto for insufficient experimental controls and for not sharing enough details of his approach with the scientific community. William A. Tiller, another researcher featured in the documentary What The Bleep Do We Know?, states that Emoto's experiments fall short of proof since they do not control for other factors in the supercooling of water. In addition, Emoto has been criticized for designing his experiments in ways that leave them prone to manipulation or human error influencing the findings. Biochemist and Director of Microscopy at University College Cork William Reville wrote, "It is very unlikely that there is any reality behind Emoto's claims." Reville noted the lack of scientific publication and pointed out that anyone who could demonstrate such a phenomenon would become immediately famous and probably wealthy. Writing about Emoto's ideas in the Skeptical Inquirer, physician Harriet A. Hall concluded that it was "hard to see how anyone could mistake it for science". Commenting on Emoto's ideas about clearing water polluted by algae, biologist Tyler Volk stated, "What he is saying has nothing to do with science as I know it." Stephen Kiesling wrote in Spirituality & Health Magazine, "Perhaps Emoto is an evangelist who values the message of his images more than the particulars of science; nevertheless, this spiritual teacher might focus his future practice less on gratitude and more on honesty." Emoto was personally invited to take the One Million Dollar Paranormal Challenge by James Randi in 2003 and would have received US$1,000,000 if he had been able to reproduce the experiment under test conditions agreed to by both parties. He did not participate. Emoto's book The Hidden Messages in Water was a New York Times best seller. Commenting on the book making the list, literary critic Dwight Garner wrote in The New York Times Book Review that it was one of those "head-scratchers" that made him question the sanity of the reading public, describing the book as "spectacularly eccentric." Publishers Weekly described Emoto's later work, The Shape of Love, as "mostly incoherent and unsatisfying". Emoto's ideas appeared in the movies Kamen Rider: The First and What the Bleep Do We Know!?. 水からの伝言: 世界初!! 水の結晶写真集 (Mizu kara no dengon: sekaihatsu!! mizu no kesshō shashinshū) [Messages from Water] (in Japanese). 1. Tokyo: Hado. 1999. ISBN 9784939098000. English edition: The Message from Water: The Message from Water is Telling Us to Take a Look at Ourselves. 1. Hado. 2000. ISBN 9784939098000. 水からの伝言： 世界初！！水の氷結結晶写真集今日も水にありがとう (Mizu kara no dengon: sekaihatsu!! mizu no kesshō shashinshū) [The Messages from Water] (in Japanese). 2. Tokyo: Hado. 2001. ISBN 9784939098048. English edition: The Message from Water. 2. Hado. 2001. ISBN 9784939098048. 水が伝える愛のかたち (Mizu ga tsutaeru ai no katachi) (in Japanese). Tokyo: Tokuma Shoten. 2003. ISBN 9784198617509. English edition: The Shape of Love: Discovering Who We Are, Where We Came From, and Where We are Going. New York: Doubleday. 2007. ISBN 9780385518376. Love Thyself: The Message from Water III. Carlsbad, CA: Hay House. 2004. ISBN 9781401908997. 水可以改變我生命 : "愛和感謝"的心情可以創造積極的能量 (Shui ke yi gai bian wo sheng ming : "Ai he gan xie" de xin qing ke yi chuan zao ji ji de neng liang) (in Chinese). Taibei Xian Xindian Shi. 2006. ISBN 9789576864971. English edition: The Miracle of Water. New York; Hillsboro, OR: Atria: Beyond Words. 2007. ISBN 9781582701622. Water Crystal Healing: Music & Images to Restore Your Well Being. New York; Hillsboro, OR: Atria: Beyond Words. 2006. ISBN 9781582701561. ^ "Dr. Masaru Emoto, 1943–2014". Beyond Words. 17 October 2014. Archived from the original on 23 September 2015. Retrieved 20 October 2014. ^ "Masaru Emoto" (in German). Koha Verlag. Retrieved 20 October 2014. ^ a b c Neimark, Jill (September–October 2005). "Messages from water?". Spirituality & Health. ^ Kenneth G. Libbrecht. "Snowflake Myths and Nonsense". California Institute of Technology. Retrieved 21 July 2012. ^ "The minds boggle". The Guardian. 16 May 2005. ^ a b Harriet Hall (November 2007). "Masaru Emoto's Wonderful World of Water". Skeptical Inquirer. ^ Setchfield, Kristopher. "Are Dr. Masaru Emoto's Fantastic Claims Actually Real?". is-masaru-emoto-for-real.com. ^ a b c d e Kiesling, Stephen (May–June 2009). "Latest message from water: Is Dr. Emoto a spiritual Madoff?". Spirituality & Health. Archived from the original on 2014-08-26. Retrieved 2014-08-21. ^ "Fake university 'VC' targeted only quacks to issue degrees - Times of India". The Times of India. Retrieved 2019-03-11. ^ Dunning, Brian (September 23, 2014). "Skeptoid #433: The Water Woo of Masaru Emoto". Skeptoid. Retrieved 4 May 2018. ^ Jaisankar, C. (2019-01-11). "Fake varsity sealed after operating for 12 years". The Hindu. ISSN 0971-751X. Retrieved 2019-03-11. ^ "Volume 22, Number 4 (2008) | Society for Scientific Exploration". www.scientificexploration.org. Retrieved 2016-02-09. ^ Barrett, Stephen. "Questionable Organizations: An Overview". Quackwatch. Retrieved 14 October 2013. ^ Tiller, William (2004). "What the Bleep do we Know!? : A Personal Narrative" (PDF). Vision In Action. 2 (3–4). ^ Mason, Phil (2010). Quantum Glory: The Science of Heaven Invading Earth. Maricopa, AZ: XP Publishing. p. 150. ISBN 9781936101597. ^ Randi, James (May 23, 2003). "Chiropractic Crackup, Talking to Water, Sylvia Emerges!, Bidlack's Lumps, An MS Miracle, and a Korean Magic Stone..." Swift (online newsletter). James Randi Educational Foundation. Archived from the original on 2003-06-02. ^ "The Shape of Love: Discovering Who We Are, Where We Came From, and Where We're Going". Publishers Weekly (book review). 254 (7). February 12, 2007. p. 79. ^ "The minds boggle". The Guardian. May 15, 2005. ^ Olmsted, John (October 1, 2004). "Ramtha's school of quantum flapdoodle". eSkeptic (movie review). Skeptics Society. ISSN 1556-5696. Retrieved 2014-08-21. ^ Poppy, Carrie (March 11, 2014). "A grain of truth: Recreating Dr. Emoto's rice experiment". Poppycock (blog). Committee for Skeptical Inquiry. Retrieved 2014-08-21. Orac (David Gorski) (October 6, 2006). "Your Friday Dose of Woo: H2Ooooooommmm". ScienceBlogs (blog). This page was last edited on 6 April 2019, at 06:09 (UTC).